In modern years, aesthetics has become quite important in every aspect of everyday life: following the hundreds of journals, magazines, blogs and websites pointing their attention towards this interesting and fascinating topic, the request for aesthetic medicine has increased manifolds. Aesthetic Medicine is a new field of medicine, in which different specialists share the aim of constructing and reconstructing the physical equilibrium of the individual. Treatment of physical aesthetic alterations and unaesthetic sequel of illnesses or injuries, together with the prevention of aging, are perhaps two of the most iconic areas of intervention for Aesthetic Medicine. However, in order to prevent frailty in the elderly, a program of education is similarly important. Furthermore, the line between health and beauty is extremely thin: psychosomatic disorders resulting from low selfesteem due to aesthetic reasons are frequent and can- not be ignored by a clinician. It is therefore clear that there is no figure in the field of medicine which is not involved in Aesthetic Medicine: endocrinologists, gynecologists, angiologists, psychologists and psychiatrists, plastic surgeons, dermatologists, dieticians, physiotherapists, orthopedists, physical education instructors, massophysiotherapists, podologists, and rehabilitation therapists are just some of the specialists who are sooner or later going to have to answer their patients’ needs for aesthetic interventions. The involvement of all these specialists fits the description of health as defined by the WHO: “a state of complete physical, mental and social well-being and not merely the absence of disease or infirmity” for which, undeniably, a team of different physicians is required. The number of patients requiring medical consultation for esthetic reasons is rapidly increasing: in order to be able to provide adequate feedback, medical and paramedical specialists should be trained and, more importantly, should be taught how to work together. Existing Societies of Aesthetic Medicine from different countries share the aim of creating such teams and provide constant updates to the literature: the creation of an international network of specialists from all around the world under the flag of Aesthetic Medicine represents a challenge, but at the same time it is the proof of the widespread interest in this topic. The first issue of this Journal represents the results of the efforts of the many national Societies and of the Union Internationale de Medecine Esthetique, now together as one; it is our hope that in years to come this Journal might improve our knowledge in this field, and provide adequate scientific advancement in the field of Aesthetic Medicine. Aesthetic Medicine was born in France 40 years ago. The French Society of Aesthetic Medicine was the first of its kind in the world, followed by Italy, Belgium and Spain. Starts were rather difficult as aesthetic procedures in those early years were only surgical. At that time aesthetic doctors and cosmetic dermatologists had very few real medical procedures to offer to their patients for treating aesthetic problems on face and body. At the beginning of the ‘80s, viable medical procedures started to emerge in Europe for aesthetic and cosmetic purposes. Mostly, at that time, they were imported from the United States: those included collagen injections for wrinkles (Zyderm by Dr. Stegman), and chemical peels (phenol by Dr. Baker, TCA by Dr. Oba- gi). But, subsequently, European research on Aesthetic Medicine gained momentum. Hyaluronic acid appeared on the market, as it was discovered that it could be used as a dermal filler for wrinkles. During the ‘90s, the use of lasers offered aesthetic doctors and cosmetic dermatologists new possibilities. The “beam revolution” started with CO2 laser for facial resurfacing. Today, CO2 resurfacing is not used as much anymore, because of the long and difficult postop. CO2 laser was replaced with the gentler Nd-YAG and Erbium lasers and more recently with non invasive photonic devices for facial rejuvenation, including IPL, US and radiofrequency. These new technologies allow today’s aesthetic doctors and cosmetic dermatologists to offer their patients procedures with low risk of post- op complications. Then, Botulinum Toxin has “invaded” both sides of the Atlantic Ocean. Today, Botox injections are the most popular treatment for facial expressive wrinkles. Botox injections are now so common everywhere that many cosmetic surgeons have given up their bistouries for syringes. Last but not least, development in Aesthetic Medicine is shown by mesotherapy and adipolipolysis. About lipolysis, new data and recent publications have explained that radiofrequency, ultrasounds and cryolyse could have positive action to dissolve fat and to improve some unaesthetic disorders like cellulite. These non invasive procedures intend to replace the surgical liposculpture with success. Nowadays, Aesthetic Medicine has the necessary tools to address all major disorders within the aesthetic field. After 40 years, Aesthetic Medicine is now active in 27 countries in the world (France, Italy, Spain, Belgium, Morocco, Poland, Russia, Switzerland, Romania, Kazakhstan, Algeria, Brazil, Argentina, Uruguay, Venezuela, Colombia, Chile, Mexico, U.S.A, Canada, South Korea, and recently Ecuador, China, South Africa, Turkey, Ukraine and Georgia). All 27 national Societies are members of the Union Internationale de M decine Esth tique (U.I.M.E.). Aesthetic Medicine is taught in 8 countries (France, Italy, Spain, Brazil, Argentina, Mexico, Venezuela, Kazakhstan) in universities that deliver UIME’s diplomas after 3 to 4 years of studies. What is the future of Aesthetic Medicine? In the last few decades, patients’ desires to look and feel younge, have fueled Aesthetic Medicine and Cosmetic Dermatology: many different procedures have been developed to satisfy the demands. As life-span have increased, patients today are not only asking about aesthetic procedures, they are also asking for a way to stay in good physical conditions in the last decades of their lives. As a direct result, Anti-Aging Medicine, which covers skin aging and general aging, has recently emerged and expanded very quickly. Anti-Aging Medicine can offer senior patients better nutrition, dietary supplementation with vitamins, minerals, antioxidants, and eventually hormone replacement therapy, but only when needed. Today, and in the near future, both Aesthetic Medicine and Anti-Aging Medicine will offer to our patients, who now live longer, better wellness with aesthetic treatments for skin aging and anti-aging treatments for general aging. Aesthetic Medicine is booming, but all medical practitioners should be correctly trained, so its future will be bright. When in 1977 the Italian Society of Aesthetic Medicine published the first issue of the magazine “La Medicina Estetica” Carlo Alberto Bartoletti, the Founder, wrote an editorial in which traced the pathway of the discipline and of the Scientific Society, still valid and projected into the future. Today from that Editorial Board arise an International Journal, which wants to be indexed, in order to give to the doctors practicing Aestehetic Medicine all around the world a solid basis of shared knowledge. In the late ‘60s, what was called in Italy Aesthetic Medicine, moved its first steps thanks to “remise en forme and anti aging projects” imported from the experience the “Institutul de geriatrie Bucuresti”, directed by Dr. Ana Aslan. For this reason,there is the bioethical imperative that the Discipline should be first prevention, then return to physiology and finally correction. The worldwide diffusion and the efforts of Industries born on the wave of the phenomenon have often led to choose the fastest route to achieve and maintain the physical aspect in the myth of beauty at all costs, without considering that aesthetic is not synonymous of beauty, but it is a balance between body and mind, and the role of the doctor is to take care of the Person globally and not only focusing on the correction of “a badly accepted blemish”. Faithful to the teaching of my Master had almost 50 years ago, this new journal will have the task of elevating the human resources, aligning and validating methodologies, but above all affirming the humanitas of the medical art in its purest sense to pursue the good and the graceful for the person who relies on it. All Aesthetic Doctors know that science is the basis for safety. Safety is the most important issue in our discipline. Unfortunately, Aesthetic Medicine is more often surrounded by marketing than by science, despite the hard work done by Scientific Societies all over the World. And, too often doctors working in this field are dealing with sellers that promote products with insufficient scientific studies. However, they sell it anyway. I think that doctors must learn that the first thing to ask about a medical device is the scientific background regarding that product: patients treated, follow up period, adverse events and, most of all, publications. 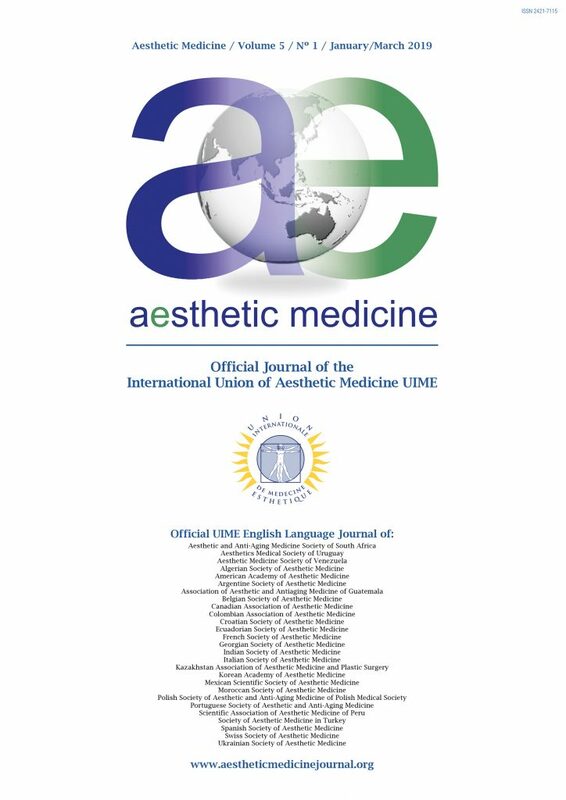 With this new International Journal completely dedicated to Aesthetic Medicine, proposed by the Italian Society of Aesthetic Medicine, endorsed by UIME and shared by all the National Societies of Aesthetic Medicine belonging to UIME, World Aesthetic Medicine wants to stimulate scientific production in this discipline to increase safety and quality in aesthetic medical procedures. Another important goal of the Journal is to catalyze the proposal of new protocols and guidelines in Aesthetic Medicine, with the consensus of the entire Aesthetic Medicine Scientific Community. What this Journal should achieve in the near future is to improve the number and quality of scientific production in Aesthetic Medicine, in order to allow this discipline to grow in the field of evidence based medicine, not only in the rationale field. I hope this can be the start of a new era for Aesthetic Medicine, with the commitment of all Scientific Societies all over the world.